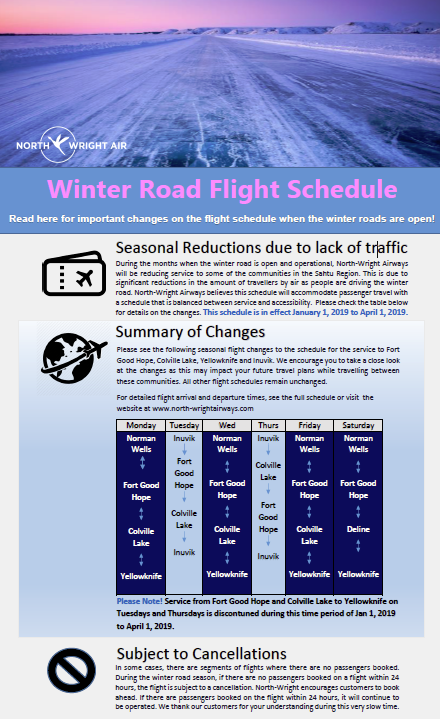 Please be advised, effective January 1, 2019 to April 1, 2019, North-Wright Airways will be adjusting the flight schedule to reflect the change in travel patterns while the winter road is open and serviceable in the Sahtu Region.This is just a seasonal adjustment to our schedule and as soon as the winter road closes, our schedule will revert back to the regular schedule, likely on April 1, 2019. We encourage you to review this schedule as it may impact your travel plans. Upon the closing of the winter road, the regular schedule will commence, as per normal. We wish you a wonderful winter and pleasant travels.